Today, we banded the two Waukegan chicks. Mary and I met at the museum and then drove up to the plant to meet Matt and Joel. This is the first time I’ve seen Joel this season and it was great to catch up! 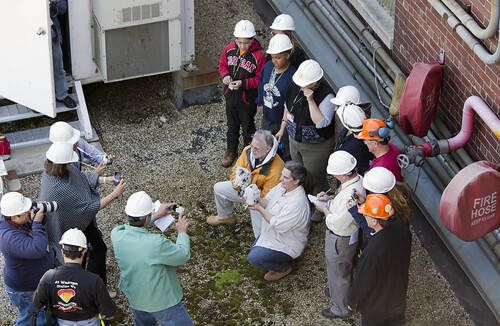 As usual, the plant had invited a rather large group to view the banding. We had a number of Waukegan city officials, a couple of local teachers and two of their students, plant employees and representatives from the local press. I really like going to Waukegan for a number of reasons. For one, the plant itself has character. It was built in 1923 and strikes me as both foreboding and beautiful. There are little architectural flourishes here and there that seem like surprising additions to a building designed entirely for dirty and hard work. I see something new every time. For two, the guards at the security booth are hilarious. They have to do a full security sweep of everyone and everything entering the plant, which can be off-putting. While it is very obvious they take the task very seriously, they use humor to make the whole experience more comfortable. They crack me up every time. For three, the plant employees are incredibly nice and always show a lot of enthusiasm with regards to their falcon residents. The female who established the Waukegan nest in 2002 is also a big reason I love going to this banding. She was born in 1999, so is one of the oldest females in the state. She has raised 40+ chicks during her reign in Waukegan and I am always glad when we confirm that she’s made it another season. And confirm it I did. While Mary, Matt and Joel set up the banding gear, I went out on the roof with my scope and camera to identify the adults. Fran was perched on a walkway railing. Her bands show the wear and tear of 14-years of high impact living and are pretty hard to read, but I was able to get a very nice look at them through the scope. The sideways “X” on the bottom green band is nearly scratched off. The male was, as usual for him, perched quite a bit further away. I stayed stationed on the camera while Mary and Matt went out in hopes that I’d get a chance at his bands. He gave me one really quick and really nice look at them, so I could confirm that Greg was back. There were two chicks for Waukegan, one male and one female. The team made short work of the banding and then posed for pictures with the group. Soon, we were on our way back out the gates, another year at Waukegan in the books. ~ by Steph on June 3, 2013.